In order to stop measles and rubella we have to know where the viruses are circulating. We do this through a Global Laboratory Network. The first signs of Measles and Rubella are symptoms of fever and rash. On sight, the two can be almost indistinguishable from one another and can also look like other diseases. Therefore it’s important that health workers take and send samples for laboratory confirmation. The Measles and Rubella Laboratory Network supports measles and rubella control through regional and country training workshops, technical support in five regions and continued quality assurance activities involving the participating laboratories. In 2014, the Network included 723 national and subnational WHO-certified laboratories serving 191 of the 194 WHO Member States, a considerable increase from fewer than 40 laboratories and 71 Member States in 1998. More than 260,000 serum samples were tested globally by the network laboratories for measles and rubella IgM antibodies in 2014. National laboratories used for polio, yellow fever and Japanese encephalitis surveillance are frequently the same laboratories or are at least in the same institute as those used for measles and rubella surveillance, allowing for cooperation between different vaccine preventable disease surveillance programmes. A critical component of laboratory surveillance is the genetic characterization of circulating wild-type viruses. Genetic sequencing information is useful in tracking global transmission patterns of the viruses, and for documenting the interruption of transmission. Disappearance of an endemic virus lineages or genotype(s) is one of the criteria for verifying measles elimination in a country or region. Currently, there are seven predominant measles genotypes circulating globally, which can be roughly attributed to geographic areas. 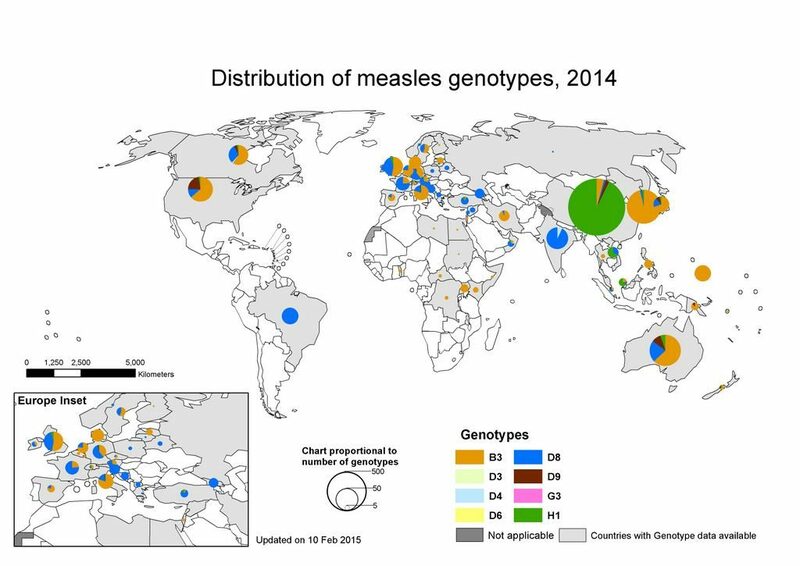 The map below shows measles genotype information for 2014.